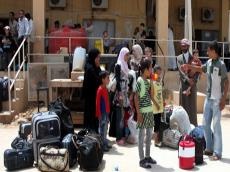 Syria’s Homs province is ready to receive refugees, including those from the Rukban camp, and ensure decent living conditions for them, Homs Deputy Governor Amir al-Khalil told reporters, Trend reports citing Reuters. "I would like to point out once again that the Homs provincial administration is ready to receive refugees, particularly from the Rukban camp, and provide them with all necessary assistance. We know that people are suffering from inhuman conditions in that camp so we need to do everything possible to stop it," al-Khalil said. In particular, the provincial authorities are ready to provide refugees with accommodation and jobs. Most of those refugees come from the Homs province and want to return home. Homs was one of the first Syrian provinces seized by militants so hundreds of thousands of civilians had to flee their homes. As many as seven million people left Syria during the war and now the country is facing labor shortages. Authorities say about 5,000 homes for refugees are ready. Schools are opening after renovations, teachers are working to compile intensive courses to help students make up for the lost time. "More than 1,300 schools have been reconstructed in the Homs province, they are ready to receive students, particularly children from the Rukban camp," the provincial deputy governor noted.